Along with Parcells, other honorees included WR Cris Carter, defensive lineman Curley Culp, offensive lineman Larry Allen, LB Dave Robinson and offensive lineman Jonathan Ogden. 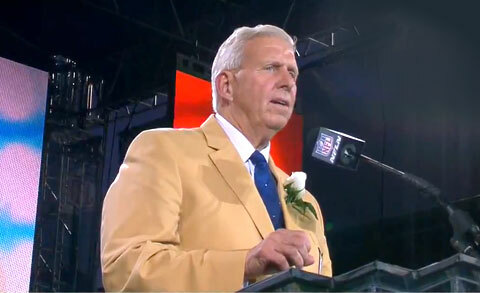 A grateful Parcells said at the end of his HOF speech, “I’m honored, I’m grateful and I’m thankful to everyone single one of you out there that had something to do with this. Parcells, whose career spanned four different teams each leading to the playoffs, will however, most likely be remembered for winning two Super Bowls with the New York Giants. Currently Parcells is an NFL analyst for ESPN. If you would like to book football speakers or NFL coaches like Bills Parcells for a speaking engagement, autograph signing, guest appearance, product endorsement, Super Bowl party, celebrity golf tournament, charity fundraiser, VIP meet & greet or special event, you can request Bills Parcells speaker & booking agent agent info or call 800.966.1380.